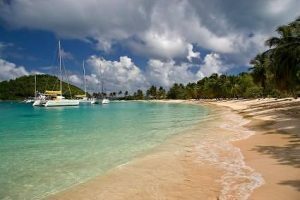 Cruise the southern reaches of the Caribbean, on a 15 day yacht charter itinerary from St. Lucia to Grenada, including St. Vincent and the Grenadines. 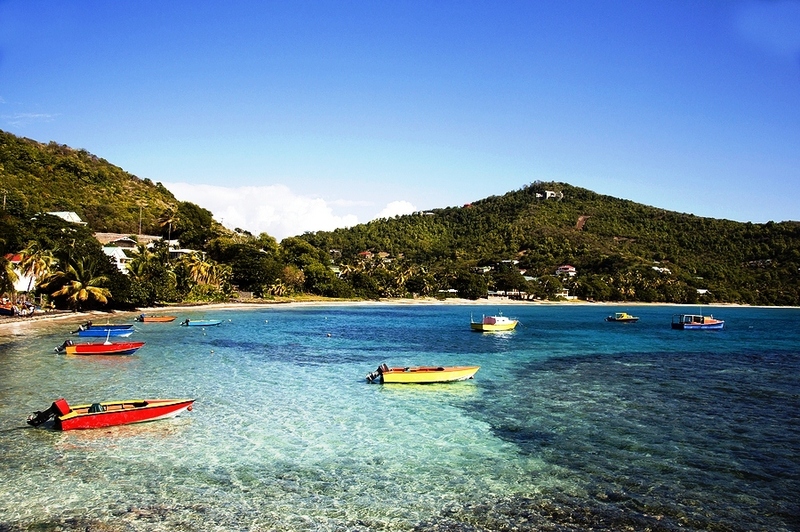 Visit the Tobago Cays National Park, and swim with the sea turtles, explore Bequia, the whaling island, drive a local “mule” on the chic island of Mustique, snorkel beautiful coral gardens on Canouan, and glide into Grenada, the spice island. on balmy trade winds, all on a crewed yacht charter cruising “downwind” from St. Lucia to Grenada. Day 1: Join your yacht in tranquil Marigot Bay, a small, sheltered anchorage in St. Lucia, one of the loveliest islands of the Eastern Caribbean. Unpack and unwind while your yacht cruises to a lovely anchorage in the area. Enjoy an afternoon swim and tropical cocktails before dining aboard. Overnight on anchor. Day 2: Head south to Soufriere, a small town dominated by the towering twin Pitons, and take a walk in the rain forest or explore the sulphur springs. This is a lovely area. Overnight on anchor. Day 3: St. Vincent is a mere 30 nautical miles away. 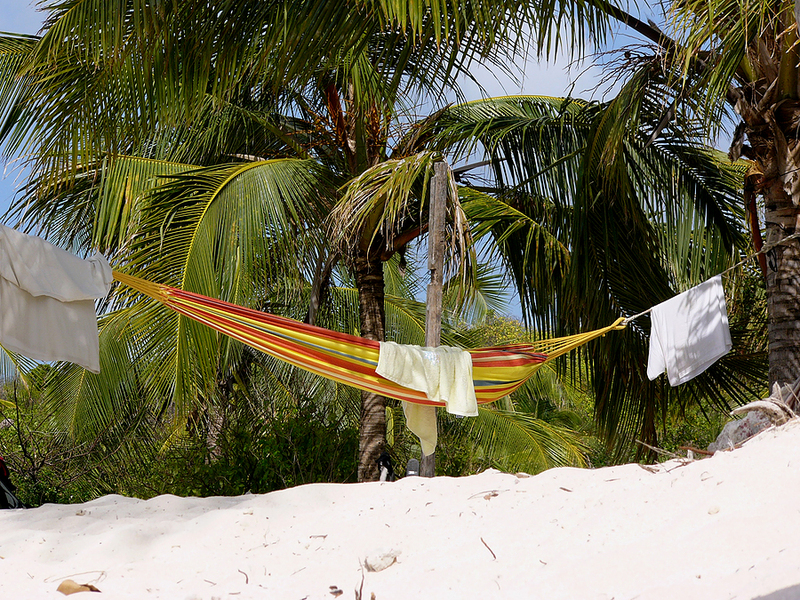 Enjoy lunch at Cumberland Bay, where a forest of coconut and banana trees flow down the valley to the beach. 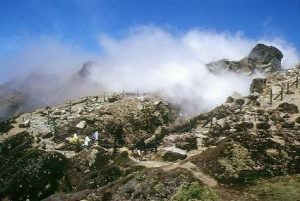 View the towering mountains and craggy peaks as you motor along the steep and wild terrain of St. Vincent. Arrive at Young Island for a swim before dinner and an overnight stay. This anchorage between Young Island and St. Vincent is very well protected and calm. Perhaps head ashore for evening cocktails at Young Island Resort. Day 4: Cruise to the nearby island of Bequia. This is a very unique Caribbean Island. In the 1800’s a native left for New England and signed onto whaling ships for 20 years. 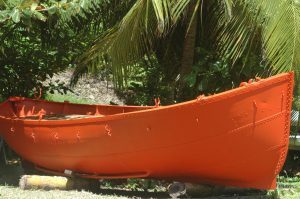 With his learned craft, the Islander returned to Bequia equipped with harpoons and other equipment and Bequia natives became whale hunters. Still allowed to catch up to 3 whales a year, there is always a local Bequian on the watch for whales spouting on the horizon. Bequians must hunt whales in the traditional manner from swift sailing skiffs, handmade on the island. Bequia is known for their boat building and also the building of boat models, and for carving half hulls. Head ashore in Admiralty Bay to explore the main town of Port Elizabeth. Enjoy your night at anchor in Admiralty Bay, and perhaps visit the well know Frangipani Hotel for cocktails on the lawn overlooking the bay. Day 5: After breakfast, cruise by the Moonhole, where the architecture of Tom Johnson’s ‘open houses’ seemingly grows out of the rocks. Cruise close to West Cay, then on past Pigeon Island and Isla A Quartre. 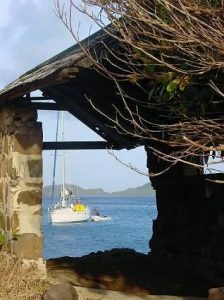 Cruise past Semplar’s Cay, where the Whaling Station can be seen. Here whales, once caught, are brought in to be cut up, and for the blubber, highly prized on Bequia as it is considered to heal all, to be rendered. This is an all island event and any islander that contributes, walks away with their fair share of whale meat and blubber. Across from Semplar’s Cove is Friendship Bay which has a lovely wrap-a-round golden beach. Perhaps head to see the very small whaling museum, just on the southern side of Friendship Bay if open. Overnight on anchor in Friendship Bay. Day 6: Cruise to nearby Mustique, about 2 hours away, cruising past Montezuma Shoal to Britannia Bay. Pick up a mooring ball (required) and meet the friendly Harbor Master. This is a private island; however, visitors are welcome. Rent a golf cart, called locally “Mustique Mules” and drive around the island where the exclusive homes of the rich and famous command the landscape sporting a wide variety of architectural styles. Visit Basil’s bar, where a chance meeting of David Bowie and Mick Jagger has been known to happen. Owned by the Mustique Company, whose shareholders are the Owners of the approximately 100 private villas on the island, this little island of only around 1400 acres, and around 500 local islanders, slumbers along in quiet elegance, a perfect location for those that want to slip away from it all. In 1958, Lord Glenconner, Colin Tennant, the 3rd Baron Glenconner, purchased the island of Mustique to begin developing the island with luxury villas for the elite. To jumpstart the development, Lord Glenconner gave Princess Margaret, Countess, of Snowdon, and sister of Queen Elizabeth II, a gift of a 10-acre plot as a wedding present, upon which Princess Margaret built the luxury villa “Les Jolies Eaux”. 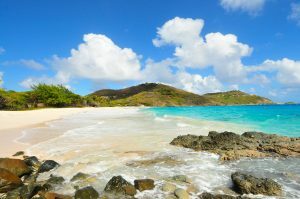 In 1989, ownership of the island of Mustique was transferred from a private family holding to a private limited company with the villa owners as shareholders. Overnight on anchor. Day 7: There are seven beautiful beaches around this island, all waiting to be visited. And the famous Cotton House 5-star luxury hotel with a bar and restaurant (reservations recommended). 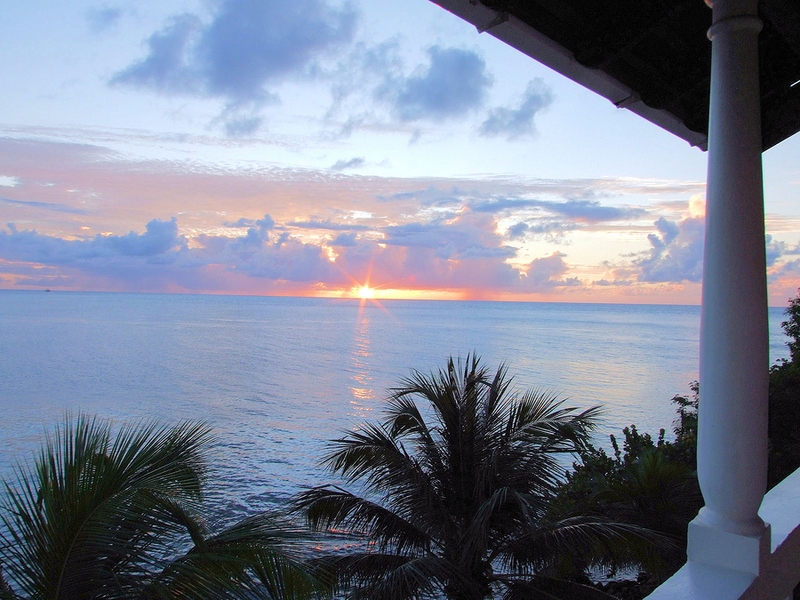 Enjoy Mustique for another day. Overnight on anchor. Day 8: Canouan is a 1.5 hour cruise. Try your hand at fishing for Tuna, Jack, King Fish or Mahi Mahi whilst cruising by Petit Mustique, Savan Island and Petit Canouan on your way to Charleston Bay, Canouan. The Tobago Cays were privately owned from at least the 16th Century up until just recently in 1999, when the government of St. Vincent and the Grenadines purchased the Tobago Cays and formed the Tobago Cays Marine Park for the general enjoyment of yachtsmen and other visitors. The warm crystal clear waters within the sand bottomed lagoon in the Tobago Cays Marine Park reflect beautiful shades of Caribbean blues and greens and are a great swimming location to enjoy the waters of the Caribbean Sea. Excellent snorkeling is right there on Horseshoe Reef with an outstanding variety of fish and coral in this protected area. And Horseshoe Reef is not the only coral reef in the area as located in surrounding waters are Egg Reef, World’s End Reef, and the Mayreau Gardens. One of the special draws is watching the sea turtles, when there, in the sea turtle watching area that has been cordoned off around the beach on Baradel Cay. Day 9: Mayreau is less than an hour away. 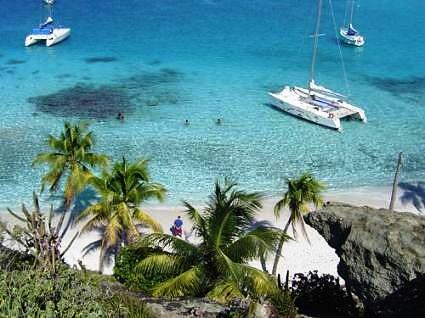 Cruise by Catholic Island through the northern passage and into the calm waters of Salt Whistle Bay – the perfect Caribbean bay – crescent shaped with a gently rising, fine sand beach backed by palm trees. The water is especially warm and beautiful fish dart in the shallows. Definitely a “secret” island of the Grenadines, the main village of Old Wall, where most of the local residents live, sits on the southwest end of the island. The village has a school for grades 1 – 6, several churches and one main road. Electricity is new to the island as of 2002. In the center of the island is a salt pond, from which the locals once harvested and exported salt, however while salt is still harvested, it is now for local use only. The locals of Mayreau now make their living from fishing and tourism. 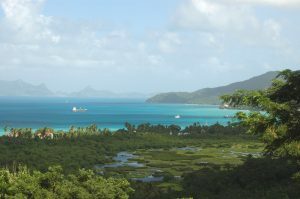 Most of Mayreau is still privately owned by the Eustace family who inherited the island from the Saint Hilaire family through marriage. The Saint Hilaire family owned Mayreau since fleeing France during the Napoleonic wars and grew Sea Island Cotton and cocoa, with the locals farming the land, on a system of land tenure, involving paying a share of profits to the Saint Hilaire family in return for the use of the land for farming and a place to build a home. Mayreau is definitely a step back into the Caribbean of yesteryear. Overnight on anchor. Day 10-11: The Tobago Cays is just a short cruise from Mayreau. 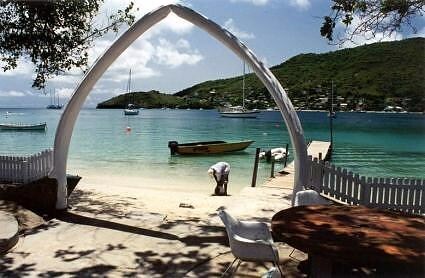 These cays are the highlight of the Grenadines for many and call for more than a fleeting visit. Five perfect uninhabited islands lie within the protection of an encircling coral reef. Cruise in through the northern approach inside the horseshoe reef and the Petite Bateau/Petit Rameau Pass. Anchor in the stunning turquoise waters, the favorite destination of many sailors. The Tobago Cays were privately owned from at least the 16th Century up until just recently in 1999, when the government of St. Vincent and the Grenadines purchased the Tobago Cays and formed the Tobago Cays Marine Park for the general enjoyment of yachtsmen and other visitors. The warm crystal clear waters within the sand bottomed lagoon in the Tobago Cays Marine Park reflect beautiful shades of Caribbean blues and greens and are a great swimming location to enjoy the waters of the Caribbean Sea. Excellent snorkeling is right there on Horseshoe Reef with an outstanding variety of fish and coral in this protected area. And Horseshoe Reef is not the only coral reef in the area as located in surrounding waters are Egg Reef, World’s End Reef, and the Mayreau Gardens. One of the special draws is watching the sea turtles, when there, in the sea turtle watching area that has been cordoned off around the beach on Baradel Cay. 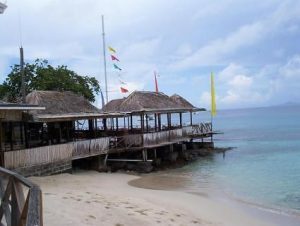 On the nearby beaches, you may see a small market crop up of goods for sale from locals that “commute” to the Tobago Cays from nearby St. Vincent. 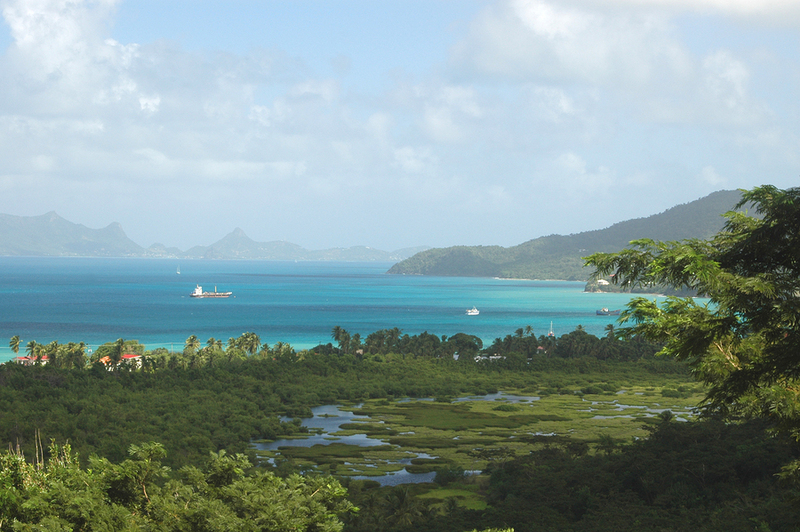 Day 12: Sandy Island, Carriacou is a 2-hour cruise. Leave the country of St. Vincent and the Grenadines and enter into the country of Grenada and Carriacou. After breakfast take a leisurely sail past Gun Point and Jack o’ Dan. Cruise into the turquoise waters between Sandy Island and the beautiful St Louis Bay, Carriacou, after sailing between Mabouya Island and Sisters Rocks. Sandy Island offers great snorkeling with chances to see Sting Rays swimming close to the yacht in the sandy anchorage. Anchor overnight. Day 13: Carriacou means “land of the reefs” and here is great snorkeling both for coral and great schools of fish. Carriacou is a big rum distillery island, with, it is said, more than 100 rum distilleries located here and there across the island. The town of Windward has a concentration of natives of Irish and Scottish descent, and is known for local boatbuilding. There are many choices of where to anchor overnight. Day 14-15: It is a short hop to Grenada, the “Spice Island”, and there are those that say that the scents of cinnamon, nutmeg, and cloves will greet you on the winds as one approaches this island. The lush mountains of Grenada tower above the bright coastal fishing villages. 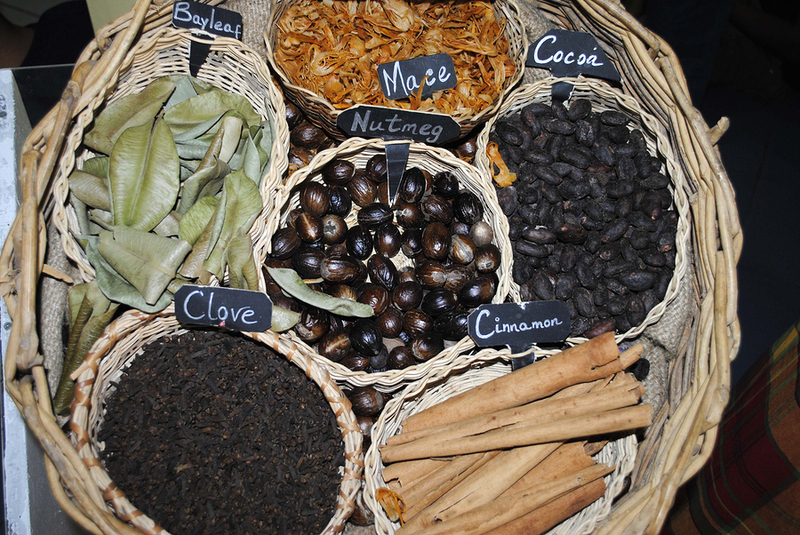 Grenada is truly the Spice Island as one of the leading world producers of cinnamon, cloves, ginger, mace, allspice, orange and citrus peels and of course, nutmeg. Besides spices, Grenada is also a leading producer of cocoa. Grenada is the second largest producer of nutmeg in the world after the Banda Islands, of Indonesia, once home to the East Indies Trading Company in the 1600’s and where nutmeg was first found. 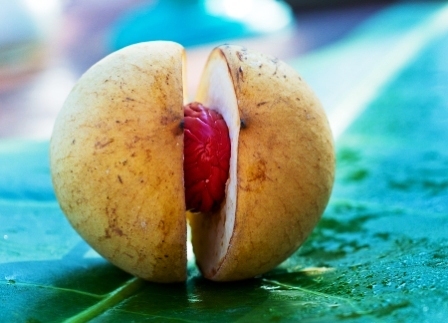 In the 1800’s nutmeg seeds were snuck out of the Banda Islands and transported to Grenada where the crop flourished with trees over 70 feet tall. The nutmeg tree requires certain soil conditions, conditions which are exactly that of the soil on Grenada, and so nutmeg trees grow in abundance on this island, with their cool leafy canopy providing excellent shade for growing the cocoa tree which thrives just under the nutmeg tree canopy. Nutmeg has been highly prized for centuries, and finding a better route to the Far East in search of the nutmeg was one of the incentives for Columbus to undertake the famous voyages of discovery. Once thought to have many curative powers, nutmeg is now usually found in cookery, and on the island of Grenada, expect the nutmeg to be grated into almost everything including rum punches, sweet and savory sauces, jams, and desserts. In fact, a household without several nutmeg nuts and a grater is not a truly Grenadian home. Grenada has beautiful beaches, the nicest said to be Grand Anse, however Grenada is also a unique and different island of spices and rain forests. The mist-enshrouded Grand Etang National Park and Forest Reserve is an experience of nature in all her glory, and home to the rare Mona Monkey. Inland dive into a pools formed at the bottom of waterfalls, or soak in a pool filled by a hot volcanic spring water. A private tour can be arranged to see spice, and cocoa plantations, along with the rain forest. A visit to Belmont Estate allows one to see how raw cocao is harvested and made into a variety of products. The main town of Georgetown is over 300 years old and is home to the Grenada National Museum. And every Saturday is Market Day with stalls filled with local island goods, including spices, cocoa, coffee, and other local island products. Grenada is home to a unique underwater sculpture park, for snorklers, located in the Molinere Bay Marine Protected Area. Snorkeling or diving here is an experience unlike any other, as just below the surface are sculptures created by British sculptor Jason deCaires Taylor around the through which one can snorkel and free dive. The sculptures range from a cyclist riding his bike on the ocean floor, to a group of somber-looking figures with linked hands, representative of the island’s history of slavery. Day 16: Disembark for an international flight home.